Code: Orphee (main part), Targhan (intro). Music: Targhan, Tom&Jerry (GPA), Frequency (System D). 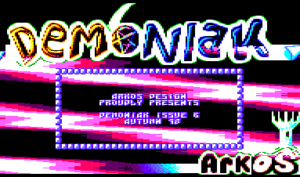 Demoniak 6 marked a major change: no more demo-parts! We decided to use a single interface for all the texts, like discmags on PC. It allowed us to concentrate on writing texts. The interface was coded by Orphee, but he really lacked time, so it was a bit buggy, coded three times, not as good as it could have been. It remains a very nice issue, thanks to the quality and quantity of the texts. Even though the first release was made on 2 discs, Chany (a well known french Cracker) released a version in one disc only! He did this miracle simply by… compacting the texts ! The version you can download is his. Thanks a lot Chany !